I recently found this wonderful surprise courtesy of the lovely and gorgeous Lyndsy of Little Irish Beauty Box. Her blog is wonderful and full of all things beautiful, so do check it out if you can – you won’t regret it! 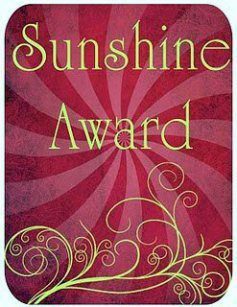 She very kindly nominated me for the Sunshine Award, which made me so happy that sunbeams were practically shining from my face. What is your favourite quote about life? I love so many quotes by different people. Some of my favourites are: “Pour yourself a drink, put on some lipstick, and pull yourself together,” by the one and only fabulous Elizabeth Taylor; “A girl should always be two things: classy and fabulous,” by the iconic Coco Chanel; and recently I’m loving this one, “You have brains in your head. You have feet in your shoes. You can steer yourself any direction you choose,” by Dr. Seuss. I think they’re all great advice for various different aspects of life! Beauty bloggers and strong women, and people who aim for the stars and follow their dreams. What simple activity makes you happy? Window shopping (and shopping generally), checking out new makeup, and just wandering around places, watching people and seeing new things, trying new snacks, and spending time with my friends. Sometimes the little things in life make you just as happy as the big things. I’ve always thought about it as half full. For the longest time, the fact that it could be half empty didn’t even occur to me. But even now, I try to always be positive and think that good things will always happen if you think good things. Here are my nominees. I tried to choose blogs that I both love, and that haven’t been nominated before (as far as I can see) to share the love! These three girls are all passionate about what they do, and I always enjoy taking a look at what they’ve been posting. 1. What have you been obsessed with lately? 3. What do you do when life gets you down? 4. What are your favourite quotes about life? Hope you’ve enjoyed reading my answers! Again, I’m so grateful and happy to everyone who reads my blog for all of the love my blog has been receiving recently. I love reading your comments, and your support means so much to me… more than words could ever say! Thank you, or, perhaps I should say ありがとう! Congrats on your sunshine award!! <3<3 I really love window shopping, too! It's very inspiring and so much fun to see what's in =) Congrats again! !